Acapela Group » Audio Description: Worldwide Text-To-Speech Audio Description for Cavena with Acapela voices. Audio Description: Worldwide Text-To-Speech Audio Description for Cavena with Acapela voices. Cavena Audio Description package provides easy text-to-speech in 30 languages, with Acapela voices. Discover the full offer during IBC 2014, in Amsterdam Sept 12-16, on Caneva Booth. 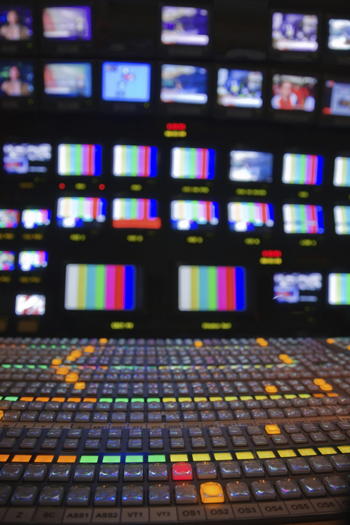 Audio description (AD) is a growing requirement for broadcasters, and serves the needs of visually impaired people who want to be able to access TV content. AD has established itself as a media access service for blind and partially sighted people across a range of countries, for different media and types of audiovisual performance (e.g. film, TV, theatre, opera) and is at the heart of European projects for the development of adequate Accessibility policies. Audio description is basically a narrator talking through a presentation, describing what is happening on the screen or stage during the natural pauses in the audio. 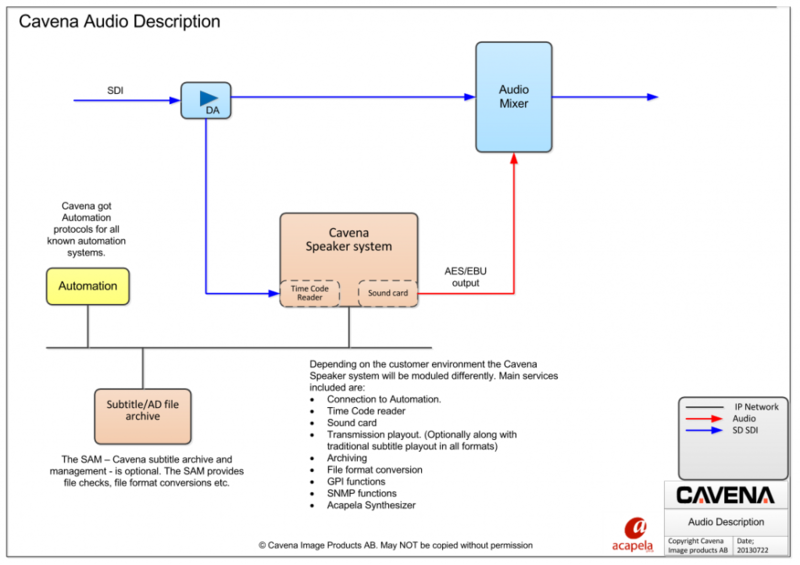 To meet the demand for AD, Cavena, a leading manufacturer of subtitling systems, has selected Acapela Group to give a voice to its text-to-speech audio description package, which incorporates the flexibility and cost advantages of subtitling. ‘Subtitling is one of the most critical parts of our customers offer to their viewers. By matching advanced programming and system design with industry standard hardware we achieve high reliability and upgradeability. The text-to-speech package will enable SBS Discovery Media to meet users demands and open up easy TV viewing to the visually impaired. Users who cannot read the small text at the bottom of the TV screen, will now be able to listen to it. Furthermore, it will ease access for illiterate people or users that find it difficult to follow written subtitles’ says Henrik Moberg CEO, from Cavena. ‘We are very enthusiastic about working with Cavena. The capacity of text-to-speech to turn any written text into natural audio will meet the demand from visually impaired users to access more content. Our synthetic voices offer a highly natural result to the end user while permitting the localization of programs in over 30 languages. Audio subtitling can even be seen as a new way to facilitate audiovisual localization – and we look forward to that’ says Lars-Erik Larsson, CEO of Acapela Group. At Acapela Group, we invent speech solutions to vocalize any written content with authentic and original voices that express meaning and intent. Over 100 synthetic voices in 30 languages are ready to give a voice to any content, producing a natural and pleasant audio result, by turning written input into speech. We can create the voice your company needs. Just for you. This is Acapela bespoke expertise. Let’s talk! Cavena is a leading manufacturer of subtitling systems, with a worldwide base of installed systems operating 24/7. Cavena provides state of the art subtitling solutions for everyone, from the free-lance subtitle translator to the multiple-channel playout centre.The choice of more languages anytime and anywhere includes subtitles. We assist more and more customers in transcoding, for example DVB or teletext in and DVB out. Temporary storage by recording subtitles is also possible, allowing editing and censorship before the material is re-transmitted. We also assist with OTT solutions, both integrating with streaming vendors and stand alone solutions. We are delivering text to speech audio description solutions to our customers, as its now a legal requirement in parts of Europe.